Happy 4th of July everyone! I hope you had a safe and fun holiday! I was lucky enough to celebrate on the 2nd and 3rd with my love in Pawtucket, and yesterday in Long Island, NY with my sister and her boyfriend’s family. Kidd is from a big and fabulous Italian family; I’ve been hearing about the food at their family for a while, but my expectations were exceeded when we arrived yesterday. Clams, sausage and peppers, chicken and rice… and that was just the appetizer spread! There was easily enough food to stuff 100 people. It was a great 4th of July celebration but a little indulgent. So today… back at it with a healthy start to the morning! 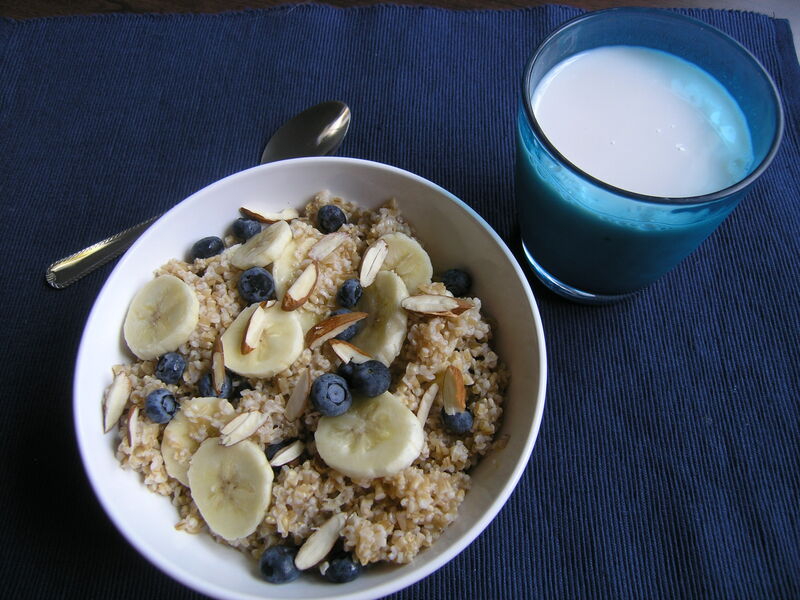 A few weeks ago I posted a recipe for Steel Cut Oats to make ahead for the workweek. I thought this was a brilliant post until I realized the strength that heat and humidity has out here on the east coast. Hot breakfast be gone! I am working my way into being a cold cereal girl again. This recipe is inspired by a recipe I made for my work in Philly at Healthy Bites, but I’m serving it cold. You can cook the quinoa (steel cut oats are a great substitute) pasta style for a few minutes in boiling water. Strain it and shock it immediately with cold water to get a cereal. I chose to make it this morning with some sliced fruit and almonds, but it really is good plain with almond milk poured over top. Light, fresh, and delicious. The perfect breakfast to get you back on track for a healthy diet. Bring at least 3 cups of water to a boil on the stovetop. When the water is boiling, add the quinoa and cook on a simmer until the quinoa is cooked through, roughly 8-10 minutes. It should be tender but still have texture. Pour the quinoa over a strainer and rinse well with cold water. Pour the quinoa into a bowl and toss with the brown sugar and cinnamon. Serve in individual bowls with 1/2 of a sliced banana, a quarter cup of blueberries, and 1 tbs sliced almonds. You can pour milk over like cereal or serve it on the side. Looks great, figure this ‘puffed’ quinoa out. I’ve had it from a L.A. grocery store (organic) and at a local favorite here in Denver. I SO want to know how and where to get it. Help sweet girl.